The following article was published in the Associated Press. Brian Skoloff writes about an incident with Mexican drug smugglers crossing the border. 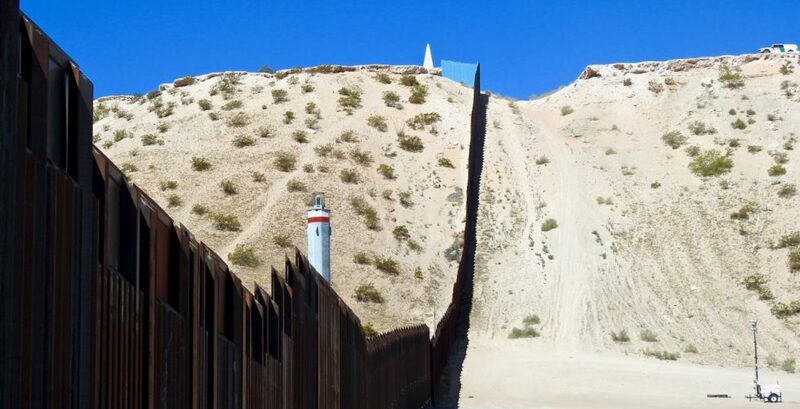 NOGALES, Ariz. (AP) — A pair of Mexican drug smugglers in camouflage pants, bundles of marijuana strapped to their backs, scaled a 25 foot-high fence in the middle of the night, slipped quietly into the United States and dashed into the darkness. U.S. Border Patrol agents and local police gave chase on foot — from bushes to behind homes, then back to the fence. The conflict escalated. Authorities say they were being pelted with rocks. One agent responded by aiming a gun into Mexico and firing multiple shots at the assailant, killing a 16-year-old boy whose family says was just in the wrong place at the wrong time. The Oct. 10 shooting has prompted renewed outcry over the Border Patrol’s use-of-force policies and angered human rights activists and Mexican officials who believe the incident has become part of a disturbing trend along the border — gunning down rock-throwers rather than using non-lethal weapons. The Department of Homeland Security Office of Inspector General has launched a probe of the agency’s policies, the first such broad look at the tactics of an organization with 18,500 agents deployed to the Southwest region alone. The Mexican government has pleaded with the U.S. to change its ways. And the U.N. High Commissioner for Human Rights has questioned the excessive use of force by Border Patrol. At least 16 people have been killed by agents along the Mexico border since 2010, eight in cases where federal authorities said they were being attacked with rocks, said Vicki Gaubeca, director of the ACLU’s Regional Center for Border Rights in Las Cruces, N.M. The Border Patrol says sometimes lethal force is necessary: Its agents were assaulted with rocks 249 times in the 2012 fiscal year, causing injuries ranging from minor abrasions to major head contusions. It is a common occurrence along the border for rocks to be thrown from Mexico at agents in the U.S. by people trying to distract them from making arrests or merely to harass them — particularly in areas that are heavily trafficked by drug smugglers and illegal immigrants. The Border Patrol has declined to discuss its use of lethal force policy in detail, but notes agents may protect themselves and their colleagues when their lives are threatened, and rocks are considered deadly weapons. Kent Lundgren, chairman of the National Association of Former Border Patrol Officers, recalled a time in the 1970s when he was hit in the head while patrolling the border near El Paso, Texas. It is extremely rare for U.S. border authorities to face criminal charges for deaths or injuries to migrants. In April, federal prosecutors said there was insufficient evidence to pursue charges against a Border Patrol agent in the 2010 shooting death of a 15-year-old Mexican in Texas. In 2008, a case was dismissed against a Border Patrol agent facing a murder charge after two mistrials. Witnesses testified the agent shot a man without provocation but defense attorneys contended the Mexican migrant tried to hit the agent with a rock. Meanwhile, Mexican families have filed multiple wrongful death lawsuits (find out details at https://www.mkhlawyers.com/legal-services/personal-injury-lawyer/), and the U.S. government, while admitting no wrongdoing, has paid out hundreds of thousands of dollars. Last year, the family of the illegal immigrant killed by the agent whose murder case was dismissed reached an $850,000 settlement. The agent remains employed by Border Patrol. Even the Mexican government has asked for a change in policy, to no avail, though Border Patrol points out that Mexico has put up no barriers on its side of the border and does little, if anything, to stop the rock throwers from assaulting agents. “We have insisted to the United States government by multiple channels and at all levels that it is indispensable they revise and adjust Border Patrol’s standard operating procedures,” Mexico’s Foreign Ministry said in a written statement. Elsewhere around the world, lethal force is often a last resort in such cases. Israeli police, for instance, typically use rubber bullets, water cannons and tear gas to disperse rock-throwers. Israeli police spokesman Micky Rosenfeld said officers use live fire only as a last resort and first fire warning shots. “There is no such crowd incident that will occur where the Israeli police will use live fire unless it’s a critical situation where warning shots have to be fired in the air,” Rosenfeld said. Border Patrol agents since 2002 have been provided weapons that can launch pepper-spray projectiles up to 250 feet away. The agency did not provide statistics on how many times they have been used, but officials are quick to note agents along the U.S.-Mexico border operate in vastly different scenarios than authorities in other countries. They often patrol wide swaths of desert alone — unlike protest situations elsewhere where authorities gather en masse clad in riot gear. Experts say there’s little that can be done to stop the violence, given the delicacies of diplomatic relations between the two countries and the fact that no international law specifically covers such instances. During a visit to the Border Patrol’s training academy in Artesia, N.M., officials refused comment on all questions about rock-throwing and use of force. At the sprawling 220-acre desert compound, prospective agents spend at least 59 days at the academy, learning everything from immigration law to off-road driving, defense tactics and marksmanship. “We’re going to teach them … the mechanics of the weapon that they’re going to use, the weapons systems, make them good marksmen, put them in scenarios where they have to make that judgment, shoot or not shoot,” said the training academy’s Assistant Chief Patrol Agent James Cox. In the latest scenario, the two smugglers were attempting to climb the fence back into Mexico, while Border Patrol agents and Nogales Police Department officers ordered them down. “Don’t worry, they can’t hurt us up here!” one suspect yelled to the other. Then came the rocks. The police officers took cover, but at least one Border Patrol agent went to the fence and opened fire on Jose Antonio Elena Rodriguez, who was shot seven times, according to Mexican authorities. The Border Patrol has revealed little information about the case as probes unfold on both sides of the fence that separates Nogales, Ariz., from Nogales, Sonora, literally a stone’s throw from each other. The FBI is investigating, as is standard with all Border Patrol shootings, and the agency won’t comment “out of respect for the investigative process,” said U.S. Customs and Border Protection spokesman Michael Friel. The teen’s mother claims her son had nothing to do with drugs or throwing rocks. She says he was just walking past the area a few blocks from home and got caught in the crossfire. None of the training, political maneuvering or diplomatic tip-toeing matters to her. She just wants her boy back. She just wants answers. Associated Press Writer Josef Federman contributed to this report from Israel. NOGALES, Arizona (AP) – Un par de narcotraficantes mexicanos con pantalones de camuflaje, paquetes de marihuana atados a la espalda, en una escala de 25 metros de altura, cerca de la mitad de la noche, se deslizó silenciosamente en los Estados Unidos y se precipitó en el oscuridad. EE.UU. agentes de la Patrulla Fronteriza y la policía local lo persiguió a pie – desde detrás de los arbustos para hogares, luego de vuelta a la cerca. El conflicto se intensificó. Las autoridades dijeron que estaban siendo atacados con piedras. Un agente respondió que apunta un arma a México y disparar varias tomas con el agresor, matando a un joven de 16 años cuya familia dice que estaba en el lugar equivocado en el momento equivocado. El 10 de octubre de disparo ha provocado protestas renovado por el uso de pólizas vigentes de la Patrulla Fronteriza y enojado activistas de derechos humanos y funcionarios mexicanos que creen que el incidente se ha convertido en parte de una tendencia inquietante a lo largo de la frontera – matar a tiros a lanzadores de piedras en lugar de utilizar armas no letales. El Departamento de Seguridad Nacional de la Oficina del Inspector General ha puesto en marcha una investigación sobre las políticas de la agencia, la primera mirada tan amplia en la táctica de una organización con 18.500 agentes desplegados en la región suroeste sola. El gobierno mexicano ha pedido a los EE.UU. a cambiar sus maneras. Y el comisionado de la ONU para los Derechos Humanos ha cuestionado el uso excesivo de la fuerza por parte de la Patrulla Fronteriza. La Patrulla Fronteriza dice que a veces la fuerza letal es necesario: Sus agentes han asaltado con piedras 249 veces en el año fiscal 2012, provocando lesiones que van desde abrasiones leves contusiones a la cabeza grandes. Es un hecho común a lo largo de la frontera por las rocas para ser lanzado desde México a los agentes en los EE.UU. por gente que trata de distraer la atención de los arrestos o simplemente para hostigar – particularmente en áreas que son muy transitadas por contrabandistas de drogas e inmigrantes ilegales. La Patrulla Fronteriza se ha negado a discutir su uso de la política de la fuerza letal en detalle, pero los agentes notas pueden proteger a sí mismos ya sus colegas cuando sus vidas están en peligro, y las rocas se consideran armas mortales. Kent Lundgren, presidente de la Asociación Nacional de Ex Funcionarios de la Patrulla Fronteriza, recordó la vez en la década de 1970 cuando fue golpeado en la cabeza mientras patrullaba la frontera cerca de El Paso, Texas. “Se me puso de rodillas”, dijo Lundgren. “Tuvimos que el rock me pilló en el templo, que habría sido letal, no tengo ninguna duda”. Es muy raro que las autoridades fronterizas de Estados Unidos para enfrentar cargos penales por muerte o lesiones a los migrantes. En abril, los fiscales federales dijeron que no había pruebas suficientes para presentar cargos contra un agente de la Patrulla Fronteriza en el asesinato de 2010 de un mexicano de 15 años que vive en Texas. En 2008, un caso fue despedido contra un agente de la Patrulla Fronteriza enfrenta a una acusación de asesinato después de dos anulaciones de juicios. Los testigos declararon que el agente disparó a un hombre sin provocación pero los abogados de la defensa sostuvo que el migrante mexicano trató de golpear al agente con una roca. Mientras tanto, las familias mexicanas han presentado varias demandas por muerte injusta, y el gobierno de los EE.UU., aunque admite ninguna fechoría, ha pagado cientos de miles de dólares. El año pasado, la familia del inmigrante ilegal asesinado por el agente cuyo asesinato causa fue sobreseída llegado a un acuerdo de $ 850.000. El agente sigue empleado por la Patrulla Fronteriza. Incluso el gobierno mexicano ha pedido un cambio en la política, en vano, a pesar de los puntos de la Patrulla Fronteriza que México ha puesto ningún obstáculo en su lado de la frontera y hace poco o nada para detener a los lanzadores de piedras de agredir a los agentes. “Hemos insistido al gobierno de Estados Unidos por múltiples canales y en todos los niveles que es indispensable que revisar y ajustar los procedimientos estándar de operación de la Patrulla Fronteriza”, dijo el Ministerio de Relaciones Exteriores de México en un comunicado. En otras partes del mundo, la fuerza letal es a menudo el último recurso en estos casos. La policía israelí, por ejemplo, suelen utilizar balas de goma, cañones de agua y gases lacrimógenos para dispersar a lanzadores de piedras. Portavoz de la policía israelí Micky Rosenfeld dijo que los agentes utilizar fuego real sólo como último recurso y los primeros disparos de advertencia contra incendios. “No hay un incidente tal multitud que se producirá cuando la policía israelí va a utilizar fuego real a menos que sea una situación crítica en tiros de advertencia tienen que ser despedido en el aire”, dijo Rosenfeld. Los agentes de la Patrulla Fronteriza desde 2002 se han suministrado armas que pueden lanzar gas pimienta proyectiles de hasta 250 pies de distancia. La agencia no proporcionó estadísticas sobre el número de veces que se han utilizado, pero las autoridades se apresuran a señalar los agentes a lo largo de la frontera México-Estados Unidos operar en escenarios vastamente diferentes a las autoridades de otros países. A menudo patrullan amplias franjas de desierto sola – a diferencia de las situaciones de protesta en otros lugares donde las autoridades se reúnen en masa vestido con uniforme antidisturbios. Los expertos dicen que no hay mucho que se puede hacer para detener la violencia, dadas las delicias de las relaciones diplomáticas entre los dos países y el hecho de que el derecho internacional no se refiere específicamente a tales casos. “En última instancia, la política de la más amplia relación México-Estados Unidos va a jugar un papel mucho más grande que la ley”, dijo Kal Raustiala, profesor de derecho y director del Centro Burkle para las Relaciones Internacionales de la UCLA. “Los intereses son demasiado altos en ambos lados para que la indignación de México, que es totalmente comprensible, determinar el resultado aquí”. Durante una visita al centro de entrenamiento de la Patrulla Fronteriza en Artesia, NM, los funcionarios se negaron a comentar sobre todas las cuestiones sobre que arrojan piedras, y el uso de la fuerza. En el complejo extenso desierto 220-acre, los agentes potenciales pasar al menos 59 días en la academia, el aprendizaje de todo, desde la ley de inmigración para la conducción off-road, tácticas de defensa y puntería. “Vamos a enseñarles … la mecánica del arma que vamos a utilizar, los sistemas de armas, los convierten en buenos tiradores, ponerlos en situaciones en las que tienen que hacer ese juicio, lanzar o disparar, no “, dijo el asistente de la academia de entrenamiento del Jefe de la Patrulla agente James Cox. En el último escenario, los dos contrabandistas intentaban escalar la valla de regreso a México, mientras que los agentes de la Patrulla Fronteriza de Nogales y funcionarios del Departamento de Policía les ordenó abajo. “No te preocupes, no pueden hacernos daño aquí!” sospechar gritó a la otra. Luego vinieron las rocas. Los agentes de policía se puso a cubierto, pero al menos un agente de la Patrulla Fronteriza fue a la valla y abrieron fuego contra José Antonio Elena Rodríguez, quien recibió siete disparos, según las autoridades mexicanas. La Patrulla Fronteriza ha revelado poca información sobre el caso como sondas se desarrollan en ambos lados de la valla que separa a Nogales, Arizona, de Nogales, Sonora, literalmente a tiro de piedra de la otra. El FBI está investigando, como es habitual con todos los disparos de la Patrulla Fronteriza, y la agencia no hará comentarios “por respeto al proceso de investigación”, dijo EE.UU. Aduanas y Protección Fronteriza vocero Michael Friel. La madre de la adolescente afirma que su hijo no tenía nada que ver con las drogas o las rocas que lanzan. Ella dice que él estaba caminando más allá de la zona a pocas cuadras de su casa y quedó atrapado en el fuego cruzado. Nadie en el entrenamiento, maniobras políticas o diplomáticas asuntos Toeing punta a ella. Ella sólo quiere a su hijo de vuelta. Ella sólo quiere respuestas. Associated Press Josef Federman contribuyó con este despacho desde Israel.